Fibres may be considered the most important ingredient in the recipe for UHPC due economical, ductility and durability reasons. ECONOMICAL. An analysis of the raw materials required to produced UHPC shows that approximately 60-80% of the total price is due to fibres in a common UHPC with 2% in volume of steel fibres. This ratio can be much higher if either stainless steel fibres or larger fibre amount is used. DUCTILITY. It is unsafe to design UHPC structures without fibres since a minimum material ductility is required! Fibres provide that ductility when using properly. DURABILITY. Fibres help control cracking, which also contributes to increase the lifespan of structures. That is why is completely necessary to know some key points about its use. Among all available fibres in the market, steel fibres arise as the most suitable ones for structural applications in UHPC. In those structural applications, specially in buildings, in which a certain degree of fire resistance is required, polypropylene fibres are often used in combination with steel fibres. For architectural applications with either none or very low structural requirements, probably PVA and stainless steel fibres are the most common. This post is focused on steel fibres, particularly, smooth-straight fibres as they have a better balance between economy and efficiency. In case of using a special coating, material and amount used must also be declared as it may have an important influence on the fibre - matrix bond, specially in the long-term. 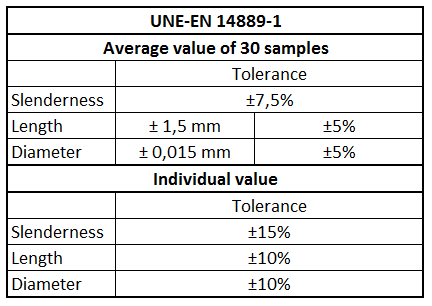 Declaration of other parameters included in EN-14889, such as the influence of fibres on concrete consistency or strength, has no meaning in fibres for UHPC, and probably it has not either for conventional fibre concrete. 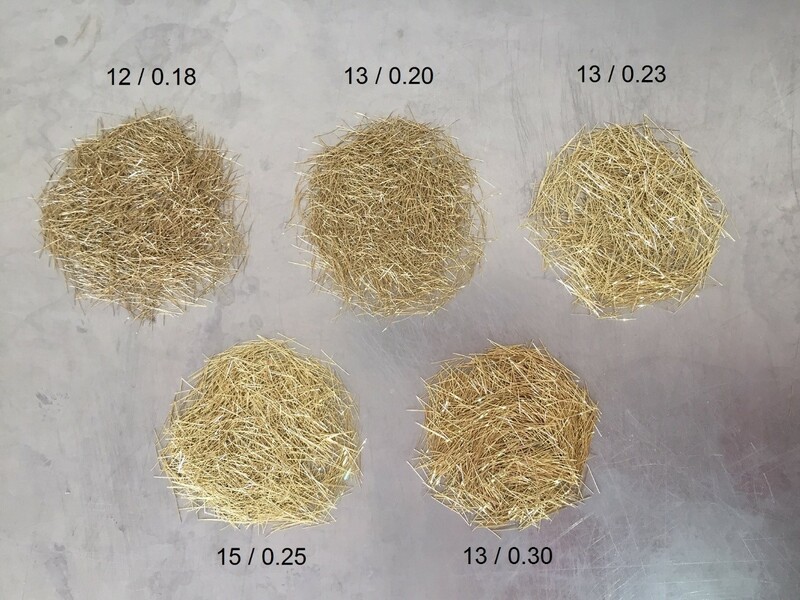 The influence of fibres on these properties not only depend on the fibre by itself, but on the amount used, mixing or pouring technology, grading curve, compressive strength of concrete, … Ensuring a good workability and strength is a task for the UHPC manufacturer and has nothing to do with fibre producers. Fibre length is a parameter that must be defined during the project phase, as this parameter may affect cross-section geometry, reinforcement layout and cover. 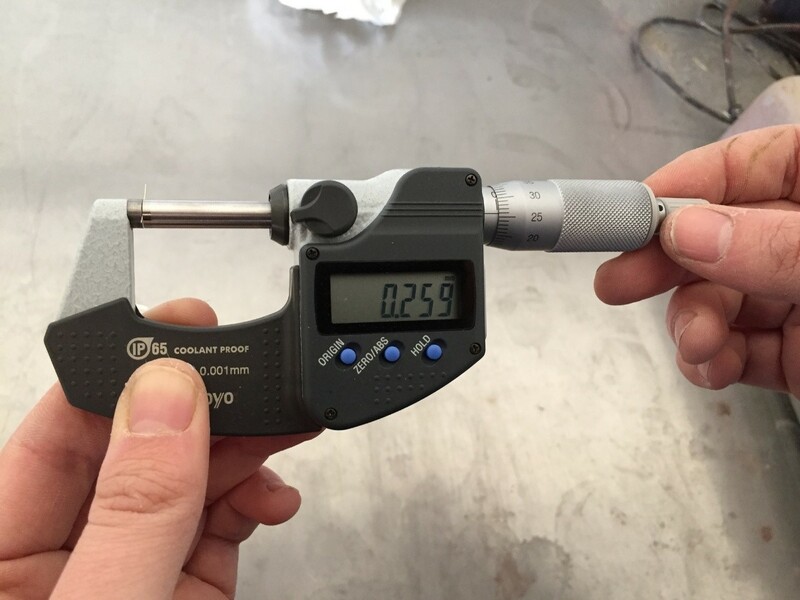 It is commonly accepted that fibre length must be at least 3 times the maximum aggregate size to ensure a suitable behaviour of fibres inside concrete. As fibre length is larger than maximum aggreagte size, cover and rebar spacing limitations established in design standards with the purupose of avoiding segregation of concrete are referred to the fibre length instead of maximum aggregate size in case of fibre reinforced concretes. 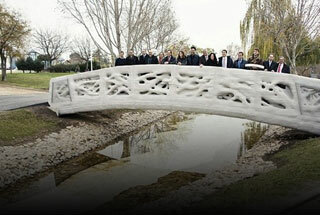 Note that UHPC designs tend to minimise cross-sections to achieve maximum efficiency of UHPC and competitiveness. That is why is completely necessary to minimise cover and rebar spacing in design. As these parameters increase according to fibre length, recipes for UHPC keep fibre length as short as possible. Once fibre length has been defined, the desired slenderness must be chosen. Even though this is not a structural project parameter, it has a strong influence on the matrix - fibre bond, therefore, in the tensile strength and ductility of UHPC. 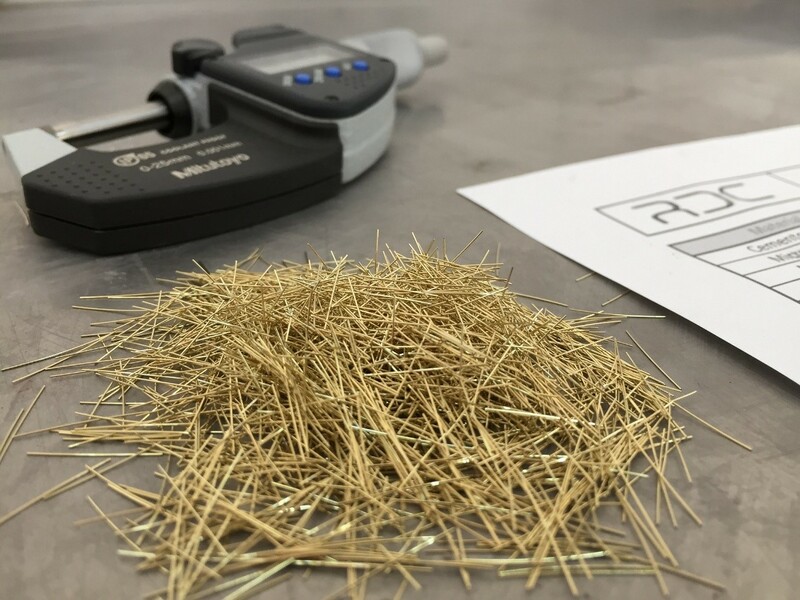 As slenderness is defined as fibre length to diameter ratio, defining the slenderness is the same thing as defining the fibre diameter once its length has been established. The broad range of fibres available in market makes having the specific fibre type needed to optimise a UHPC design possible!! Choose wisely!! Look at the following picutre. You can see different steel short-smooth fibres for UHPC available in the market. Common definition is used. First number corresponds to fibre length and second one to the fibre diameter. Another important parameter of fibres is the yield strength of the wire used to manufacture them. Even though maximum stress reached by fibres inside a UHPC is not higher than 1000 MPa, yield strength of wires used to produce them is commonly above 2000 MPa. Why? Is that a waste of money? It may be an attempt to avoid the formation of fibre balls during mixing. High slenderness ratio together with a small yield strength makes fibres easy to bend during mixing without an elastic recovering of deformation, favouring the formation of fibre balls during mixing and leading to lower tensile strength in the hardened state. Look at the following fibre diameter measurement. It was supposed to be 0.20 mm!! This result leads to following question: how reliable are some of available fibres in market? 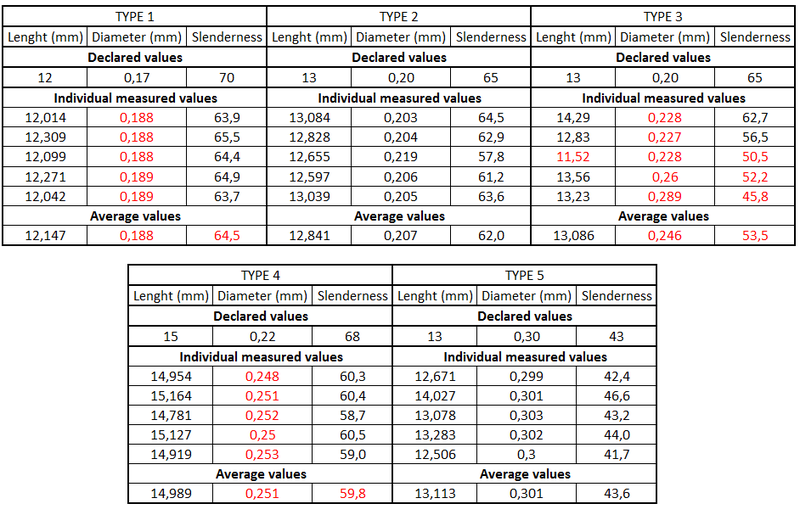 In the following table the length and diameter measurements of 5 samples taken from 5 different types of fibres are shown, together with their declared properties. In red, nonconformities are highlighted!! Always demand the standard and declaration of performance to your fibre provider to avoid unpleasant surprises!! The quality of your UHPC depends on it! !